Study of a Colombian Family with Hypertrophic Cardiomyopathy and Sudden Cardiac Death Associated with the Lys247arg Mutation in the Cardiac Troponin T (Tnnt2) Gene: Casual Relationship or Polymorphism? Copyright: © 2014 Mora GP, et al. This is an open-access article distributed under the terms of the Creative Commons Attribution License, which permits unrestricted use, distribution, and reproduction in any medium, provided the original author(s) and source are credited. Introduction and Objectives: Hypertrophic cardiomyopathy is the most common genetic cardiovascular disease. Mutations have been described in at least 27 genes that can encode sarcomere proteins, mitochondrial proteins and proteins that control calcium handling. This report shows a family with Hypertrophic cardiomyopathy in the presence of sudden death. Methods: We performed a clinical, genetic and molecular biology to establish the phenotypic and genotypic commitment of this disease. We analyzed a total of 592 mutations in 16 genes spread ACTC, GLA, MYBPC3, MYH6, MYH7, MYL2, MYL3, MYLK2, MYO6, PRKAG2, TCAP, TNN1, TNNI3, TNN2, TPM1 and TTN. Results: We determined phenotypic and genotypic characteristics of 37 members belonging to one family in five generations. Lys247Arg (K247R) mutation was found in 13 family members (38.23%) of which 3 had hypertrophy on echocardiography, but two patients had hypertrophy and they did not have the mutation. Moreover, a patient carries the mutation but the mother does not. The father (not related to the family) carries this mutation. Conclusions: We present a Colombian family with hypertrophic cardiomyopathy and sudden death where described causal mutations in the sarcomeric genes were evaluated. K247R genetic variant in the Troponin T type 2 gene was found with no correspondence to the phenotypic expresion of the disease in the family. Hypertrophic cardiomyopathy (HCM) is the most common genetic cardiovascular disease with a prevalence close to 0.2% [1,2]. It is characterized by left ventricular hypertrophy with no hemodynamic or infiltrative cause . The clinical manifestations vary from asymptomatic patients to severe heart failure or sudden cardiac death (SCD) . The latter may be the first manifestation of the disease and constitutes the most common cause of death among young athletes . Some of the predisposing factors for suffering SCD include: recovery from previous SCD, syncope, family history of SCD, non-sustained ventricular tachycardia, severe septal hypertrophy (>30 mm) or hypotension during exercise . The genetic evaluation of this disease has progressed rapidly, leading to the description of mutations in at least 27 genes encoding for sarcomere proteins, mitochondrial proteins and proteins that manipulate calcium control . Since a family history of SCD is a risk factor for dying, it has been suggested that there are "malignant" genetic variations that are responsible for such risk. It has been found that mutations in troponin T and some mutations in the beta-myosin heavy chain are related to SCD [8,9]. This report shows a family with HCM and a history of SCD, in which clinical, genetic and molecular biology analyses were conducted to establish the phenotypic and genotypic characteristics of this disease. This study was approved by the ethics committee from the faculty of Medicine of the National University of Colombia. All the patients or legal guardians of minors who participated in the study signed an informed consent form. After reading, clarifying, approving and giving their signed informed consent, each family member was interviewed about the signs and symptoms of the disease, their clinical history and then underwent a complete physical examination. Subsequently, each patient underwent a 12-lead electrocardiogram (Cardiolin AR600adv) and an M-mode, Doppler and two-dimensional echocardiography (Philips Sonos 5500). These tests were evaluated by a cardiologist not related to the research team. Finally, each family member provided a venous blood sample, which was purified and used to isolate the genetic material (DNA) of each family member for studying HCM-associated mutations. Based on these data, a complete pedigree family was performed. The DNA was extracted from the peripheral blood samples obtained from each family member using a commercial DNA extraction kit (Invitrogen - PureLink™ Genomic DNA). Online mutation databases were used for mutation selection (www.hgmd.org, cardiogenomics.med.harvard.edu/home and www.angis.org.au/Databases/Heart/heartbreak.html) as well as information from our own studies in the laboratory of about 1500 patients. We tryed to include include in the study all the mutations, which at the time of design were described as possibly responsible for hypertrophic cardiomyopathy in some family, or as a potential modifier of phenotype (Table 1). A total of 592 mutations spread over 16 genes were analyzed. Such mutations were located in these genes: ACTC, GLA, MYBPC3, MYH6, MYH7, MYL2, MYL3, MYLK2, MYO6, PRKAG2, TCAP, TNN1, TNNI3, TNN2, TPM1, and TTN. Sequenom Mass ARRAY analysis technology, which is based on mass spectrometry (MALDI-TOF mass spectrometry - Sequenom Mass ARRAY System and Gold genotyping IPLEX chemistry), was used for DNA sequencing, as described previously elsewhere . The presence of the gene variants was also confirmed by conventional Sanger sequencing. The phenotypic (clinical and testing) and genotype characteristics of 37 members belonging a family with HCM were determined. The average age of the family members was 24.8 years (1 - 88 years) and 51.3% of them were males. No family member had hypertrophy on electrocardiogram according to standardized criteria and validated by Romhilt and Estes . Five members (13.71%) had left ventricular hypertrophy determined by echocardiography, two asymmetric septal involvement, two concentric and one distal. Cardiovascular symptoms occurred only in patients with severe hypertrophy (I - 2 and II - 9) (Figure 1) and consisted of dyspnea and angina. No patient had anterior movement of the mitral valve and patients with dyspnea had mitral flow changes consistent with diastolic dysfunction. Three members of the family had died suddenly. The other affected were asymptomatic and no member reported syncope. It was concluded that patients II - 7 and III - 17 had clinical features compatible with the disease, given the history of sudden death in the second and third decades of life, respectively. Figure 1: HPLC chromatogram of the nine reference compounds in 50% aqueous methanol, measured at 370nm. Retention times for rutin, sutherlandin A, sutherlandin B, kaempferol-3-O-rutinoside, sutherlandin C, sutherlandin D, quercitrin, quercetin and kaempferol were 11.9, 12.7, 13.8, 15.3, 16.2, 17.0, 18.0, 26.2 and 28.1 minutes, respectively. We analyzed a total of 592 mutations but 41 of them failed, which produces a genotyping success rate of 93.6%. Of the genetic variants studied, we did not found causal mutation for phenotypic expression of patients. However, 13 (38.23%) family members were positive for the mutation K247R (Lys247Arg) of troponin T (NM_001001430.1), which has been previously described as causal mutation associated with HCM. The clinical and echocardiographic results are presented in Table 2. Table 2: Living and deceased patients presumably positive for the K247R mutation in TNNT2. ECG: Electrocardiogram, positive or negative according to the hypertrophy criteria reported by Romhilt and Estes electrocardiogram. n/a not applicable because they are children. MTW: Maximum thickness of the left ventricular wall. F: female. M: male. * Patients with hypertrophy as confirmed by echocardiogram. NP not performed. Surprisingly patients 1-2 and 3-3 had left ventricular hypertrophy and were negative for the mutation. Moreover the patient 4-2, a 10-year-old, carries the mutation but the mother (patient 3-2) does not have it. Given this latter finding, the father of this child was assessed finding that he (which is not related to the family) also carried the mutation. 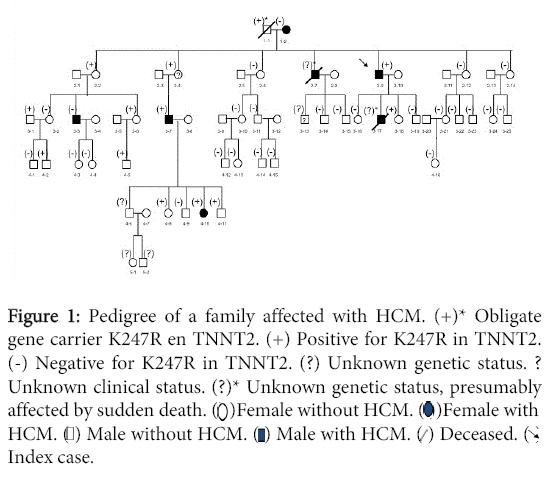 This report shows a Colombian family with HCM in which the disease onset has been SCD and genetic study found no causal mutation. However, some members of this family had the mutation K247R (Lys247Arg) in the troponin T gene previously described as a cause of disease without adequate phenotype-genotype correlation. HCM is a disease in which approximately 66% of cases, family history can show autosomal dominant transmission and incomplete penetrance . HCM most commonly affects sarcomere proteins such as the beta myosin heavy chain, the essential and regulatory myosin light chains, myosin-binding protein C, cardiac troponin T, alpha-tropomyosin, cardiac troponin I, cardiac troponin C and actin [13-19]. The most commonly reported mutations are located in the beta-myosin heavy chain (MYH7) gene and the C protein gene the myosin . MYH7 mutations have been reported in 25% of patients with HCM and in 40% of all the mutations identified . Another important gene in the pathophysiology of HCM is the TNNT2 gene located on chromosome 1q32, which encodes for the cardiac troponin T located on the thin filament cardiac muscle. TNNT2 mutations are found in 15 to 20% of patients with HCM, although it has recently been estimated that they are found in only 4.5% . It has reported that these mutations are associated with poor prognosis with high incidence of SCD and an important decrease in the life expectancy to 35 years . Clinically, TNNT2 mutations are not manifested as severe hypertrophy but show greater fiber "disarray", which is possibly associated with an increased risk of malignant ventricular arrhythmias [8,22,23]. TnT has a structural role in anchoring other troponin subunits to the thin filament through connections to tropomyosin . Its molecular function is not fully understood; however, the association of cTnT mutations with dilated and hypertrophic heart disease and the risk of sudden death imply the importance of this molecule in calcium regulation . The functional consequences of cTnT mutations are varied depending on model experimental being used. The effects have been classified as type I (increased calcium sensitivity without altering the maximum strength), type II (decreased calcium sensitivity without altering the maximum strength) and type III (increase of maximum strength without altering calcium sensitivity) . The K247R mutation was described in a Spanish study of patients and families with HCM , which evaluated 30 patients with echocardiogram confirmation of the disease. These patients were compared to 200 controls to examine mutations on troponin T and the myosin heavy chain. The authors of this study found a novel mutation (K247R) in a woman with severe septal hypertrophy but with no family history of HCM or sudden death and no other family members available to be examined. The K247R same mutation was recently described in patients with dilated cardiomyopathy (DCM) . The authors evaluated 31 patients, of whom 22 had a family history of DCM. In a man with no family history of DCM, this mutation was present, together with 2 new intron variants MYH7 (IVS39 + 7C> A) and MYBPC3 (IVS25 + 13T> A). In the K247R mutation, the lysine is replaced by a bulky arginine in the C-terminal alpha-helical end of TnT, which interacts with troponin I. As this residue is close to the E244D mutation, which interferes with sensitivity to calcium and the myosin ATPase activity , it is believed that this mutation affects the troponin T/troponin I interaction and calcium-mediated contractility control. In bovine heart preparations, Matsumoto et al. evaluated the functional changes in cTnT due to the K247R mutation . This study found a type III effect, which is less common in TnT mutations and has been described only in E244D and F110I. Residue 110 is located in the tropomyosin binding region  and it is believed that the type III effect relates to TnT interactions with tropomyosin, but residue 247 is not in contact with it. Therefore it has been suggested that this residue is critical to the operation of the troponin center, thus producing hydrophobic environment. However, the effect of this mutation does not seem to be produced by changes in the residue volume, charge or hydrophobic state. Analyses with molecular dynamics simulations found that the hydrogen network is broken by the mutation in position 247, but the K247R mutation only weakens the network by increasing the distance between hydrogen donors and recipients without actually rupturing the network itself. Indeed, it is interesting that the same K247R mutation produces hypertrophic cardiomyopathy and dilated cardiomyopathy, as this would indicate phenotypic plasticity, which is very rare and has not been reported before for any sarcomere protein, but has been described in metavinculin mutations . This study showed a family affected with HCM and SCD in which the K247R mutation seems not to be ultimately responsible to the observed phenotype in the family, since it is not present in a family member with important hypertrophy. In addition, it is present in a child without appearing on the mother (which related to the family) and appears in the child’s father who is not related to the family. The literature revision shows that this mutation has been described in an individual with no family history of HCM and another patient with dilated cardiomyopathy, also with no family history of the disease. Moreover, functional studies on the effect of this mutation show a type III effect, which is the rarest, and mild functional impairment. 1) Co-segregates with the disease in the family. Which was not found in this family? 3) It is absent in unrelated controls with similar ethnic. Currently there is available the exome sequencing project with data from the exome sequencing of more than 6500 individuals worldwide . K247R variant of TNNT2 gene (NM_001001430.1) was not present. 5) Changes in the amino acid sequence of the mutated region are highly conserved through evolution in species suggesting its importance in the basic cell. In this case it is a moderately conserved amino acid considering 14 species. Although most published studies are positive evidence, is important to show studies with negative genetic evidence as these serve to better debug databases genetic diseases. Therefore, these findings allow us to probably rule out this mutation as final responsible for the disease in the family, but we cannot dismiss it as a variant with possible modulating or regulating effect of the phenotype. We present a Colombian family with cardiomyopathy hypertrophy and sudden cardiac death in which not clear causal mutations in the sarcomeric genes were found. Nevertheless, a K247R variant in the TNNT2 gene was found, with no phenotypic correspondence; therefore, it could possibly correspond to a phenotipic modifier variant or a simple neutral genetic variant with no effect on disease. Maron BJ, Gardin JM, Flack JM, Gidding SS, Kurosaki TT,et al. (1995) Prevalence of hypertrophic cardiomyopathy in a general population of young adults.Echocardiographic analysis of 4111 subjects in the CARDIA study. Coronary artery risk development in (young) adults. Circulation 92: 785 – 9. Maron BJ, Spirito P, Roman MJ, Paranicas M, Okin PM, et al. (2004) Prevalence of hypertrophic cardiomyopathy in a population-based sample of American Indians aged 51 to 77 years (the Strong Heart Study). Am J Cardiol 93: 1510-1514. Maron BJ, Mckenna W, Danielson G, American College of Cardiology/European Society of Cardiology clinical expert consensus document on hypertrophic cardiomyopathy(2003)A report of the American College of Cardiology Foundation Task Force on Clinical Expert Consensus Documents and the European Society of Cardiology Committee for Practice Guidelines. J Am CollCardiol 42: 1687 – 913. Maron BJ (1997) Hypertrophic cardiomyopathy. Lancet 350: 127-133. Maron BJ, Shirani J, Poliac LC, Mathenge R, Roberts WC, et al. (1996) Sudden death in young competitive athletes. Clinical, demographic, and pathological profiles. JAMA 276: 199-204. McKenna WJ, Behr ER (2002) Hypertrophic cardiomyopathy: management, risk stratification, and prevention of sudden death. Heart 87: 169-176. Bos JM, Towbin JA, Ackerman MJ (2009) Diagnostic, prognostic, and therapeutic implications of genetic testing for hypertrophic cardiomyopathy. J Am CollCardiol 54: 201-211. Watkins H, McKenna WJ, Thierfelder L, Suk HJ, Anan R, et al. (1995) Mutations in the genes for cardiac troponin T and alpha-tropomyosin in hypertrophic cardiomyopathy. N Engl J Med 332: 1058-1064. Varnava AM, Elliott PM, Baboonian C, Davison F, Davies MJ, et al. (2001) Hypertrophic cardiomyopathy: histopathological features of sudden death in cardiac troponin T disease. Circulation 104: 1380-1384. Brion M, Allegue C, Gil R, Blanco-Verea A, Carracedo A, et al. (2010) Identification of a novel MYBPC3 gene variant in a patient with hypertrophic cardiomyopathy. Ann Clin Lab Sci 40: 285-289. Romhilt DW, Estes EH Jr (1968) A point-score system for the ECG diagnosis of left ventricular hypertrophy. Am Heart J 75: 752-758. Marian AJ, Roberts R (2001) The molecular genetic basis for hypertrophic cardiomyopathy. J Mol Cell Cardiol 33: 655-670. Geisterfer-Lowrance AA1, Kass S, Tanigawa G, Vosberg HP, McKenna W, et al. (1990) A molecular basis for familial hypertrophic cardiomyopathy: a beta cardiac myosin heavy chain gene missense mutation. Cell 62: 999-1006. Poetter K, Jiang H, Hassanzadeh S, Master SR, Chang A, et al. (1996) Mutations in either the essential or regulatory light chains of myosin are associated with a rare myopathy in human heart and skeletal muscle. Nat Genet 13: 63-69. Watkins H, Conner D, Thierfelder L, Jarcho JA, MacRae C, et al. (1995) Mutations in the cardiac myosin binding protein-C gene on chromosome 11 cause familial hypertrophic cardiomyopathy. Nat Genet 11: 434-437. Thierfelder L, Watkins H, MacRae C, Lamas R, McKenna W, et al. (1994) Alpha-tropomyosin and cardiac troponin T mutations cause familial hypertrophic cardiomyopathy: a disease of the sarcomere. Cell 77: 701-712. Kimura A, Harada H, Park JE, Nishi H, Satoh M, et al. (1997) Mutations in the cardiac troponin I gene associated with hypertrophic cardiomyopathy. Nat Genet 16: 379-382. LandstromAP, Parvatiyar M, Pinto J (2008) Molecular and functional characterization of novel hypertrophic cardiomyopathy susceptibility mutations in TNNC1 – encoded troponin C. J Mol Cell Cardiol45: 281 – 8. Mogensen J Klausen IC, Pedersen AK, Egeblad H, Bross P, et al. (1999) Alpha-cardiac actin is a novel disease gene in familial hypertrophic cardiomyopathy. J Clin Invest 103: R39-43. Maron BJ, Maron MS, Semsarian C (2012) Genetics of hypertrophic cardiomyopathy after 20 years: clinical perspectives. J Am CollCardiol 60: 705-715. Richard P, Charron P, Carrier L (2003). Hypertrophic cardiomyopathy. Distribution of disease genes, spectrum of mutations for molecular diagnosis strategy. Circulation 107: 2227 – 32. Moolman JC, Corfield VA, Posen B, Ngumbela K, Seidman C, et al. (1997) Sudden death due to troponin T mutations. J Am CollCardiol 29: 549-555. Ohtsuki I (1979) Molecular arrangement of troponin-T in the thin filament. J Biochem 86: 491-497. Harada K, Morimoto S (2004) Inherited cardiomyopathies as a troponin disease. Jpn J Physiol 54: 307-318. Harada K, Potter DJ (2004) Familial hypertrophic cardiomyopathy mutations from different functional regions of troponin T result in different effects on the pH and Ca2+ sensitivity of cardiac muscle contraction. J BiolChem279: 14488 – 95. García-Castro M, Reguero JR, Batalla A, Díaz-Molina B, González P, et al. (2003) Hypertrophic cardiomyopathy: low frequency of mutations in the beta-myosin heavy chain (MYH7) and cardiac troponin T (TNNT2) genes among Spanish patients. ClinChem 49: 1279-1285. Møller DV, Andersen PS, Hedley P, Ersbøll MK, Bundgaard H, et al. (2009) The role of sarcomere gene mutations in patients with idiopathic dilated cardiomyopathy. Eur J Hum Genet 17: 1241-1249. Yanaga F, Morimoto S, Ohtsuki I (1999) Ca2+ sensitization and potentiation of the maximum level of myofibrillar ATPase activity caused by mutations of troponin T found in familial hypertrophic cardiomyopathy. J BiolChem 274: 8806-8812. Matsumoto F, Maeda K, Chatake T, Maéda Y, Fujiwara S (2009) Functional aberration of myofibrils by cardiomyopathy-causing mutations in the coiled-coil region of the troponin-core domain. BiochemBiophys Res Commun 382: 205-209. Tanokura M, Tawada Y, Ono A, Ohtsuki I (1983) Chymotrypticsubfragments of troponin T from rabbit skeletal muscle. Interaction with tropomyosin, troponin I and troponin C. J Biochem 93: 331-337. Vasile VC, Will ML, Ommen SR, Edwards WD, Olson TM, et al. (2006) Identification of a metavinculin missense mutation, R975W, associated with both hypertrophic and dilated cardiomyopathy. Mol Genet Metab 87: 169-174.